Tucked away deep in the beautiful Deschutes National Forest at an elevation over 6,500 feet is scenic Three Creek Lake, south of Sisters and a 38 mile drive from Bend. There are several miles of scenic hiking and biking trails near the lake. Only about 38 miles from Bend, located south of Sisters via Forest Service Rd 16. Fish for rainbow and brook trout in this remote alpine lake. There are three campgrounds on or near the lake. Picturesque Three Creek Lake is a pristine, high alpine lake with an elevation of well over a mile at 6,500 feet. Located about 16 miles south of Sisters via Forest Service Road 16, Three Creek Lake, Oregon is a small lake, covering only 33 acres. Nearby Little Three Creek Lake is even smaller at 14 acres. Outdoor lovers are drawn to this lake to fish for trout, hike scenic trails, and camp in the beautiful Deschutes National Forest that surrounds the lake. Three Creek Lake is about a 38 mile drive from Bend. Take Hwy 20 north to Sisters, then Forest Service Rd 16 south to the lake. Fishing – This remote alpine lake has both brook trout and rainbow trout. Although motorized boats are not permitted, anglers may fish from the shore or from non-motorized boats on the lake. The trout often range from 8 to 15 inches in length. Nordic Skiing – The area surrounding the lake has over 15 miles of Nordic trails for intermediate and expert skiers. Three Creek Lake Trail, Warren’s Loop, and Snow Creek Trail are just a few of the excellent trails that Nordic skiers can enjoy. 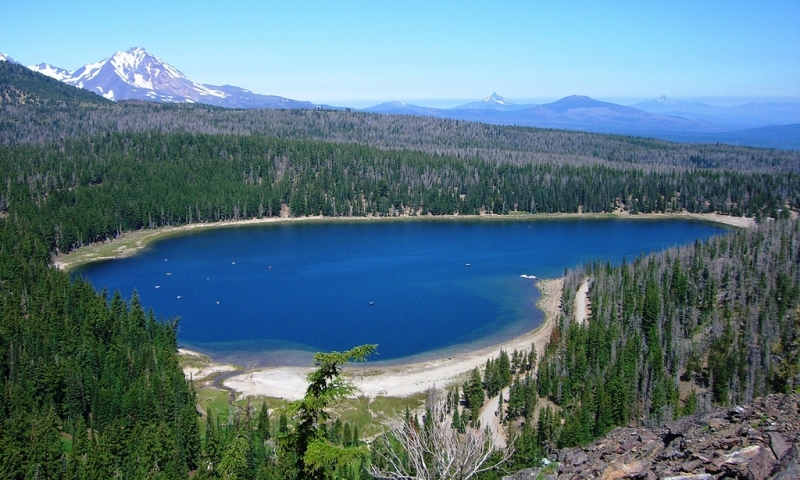 Hiking – Enjoy the scenic 10.9 mile Three Creek Lake to Broken Top Mountain trail for spectacular views of the South and Middle Sister, as well as Mt. Bachelor. Camping – There are three scenic campgrounds located on the edge of the lake or nearby. Mountain Biking – A variety of bike trails wind through the Deschutes National Forest near the lake that caters to all skill levels. Three Creek Lake is situated at an altitude of 6, 549 feet. The rainbow trout found in the lake have been stocked, but the lake’s brook trout reproduce naturally. Central Oregon is known for having over 300 days of sunshine each year.